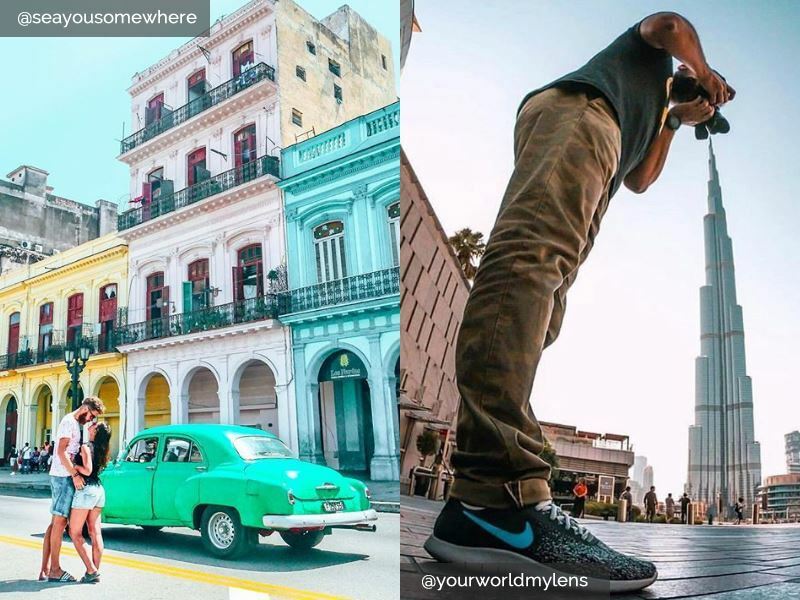 Given that it has a global community of one billion active users every month, it’s no wonder that Instagram is a huge influencer when it comes to travel photography (when was the last time you sent or received a handwritten postcard). We visit 10 of the world’s most geo-tagged cities, all of which are guaranteed to fuel your wanderlust, fill your feed with creative hashtags, impress your followers, and rack up your likes. You can follow Tropical Sky on Instagram @tropicalsky. It may lack Rio’s glamour and good looks, but Brazil’s economic capital of São Paulo has transformed from a rough-and-tumble concrete jungle into a charismatic megalopolis worthy of Instagrammable fodder. For uninitiated newbies, there’s plenty worth getting your smartphone out for beyond grey skyscrapers, abandoned buildings, and demolished urban renewal projects; mostly a new wave of art, architecture, fashion, design, food, and music (the club scene here is one of the best on the planet). One of your first stops should be Ibirapuera Park for shots of rollerbladers, runners, skateboarders, cyclists, and engaging landmarks such as Museum Afro Brazil and the Biennial Pavilion (host to São Paulo Fashion Week every January and July). 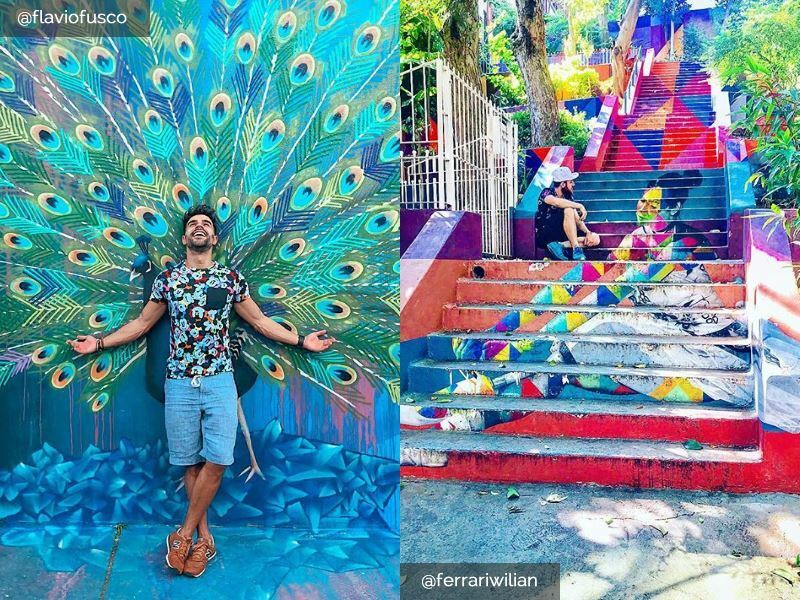 Equally rewarding is the Beco do Batman (Batman’s Alley) for its spectacular graffiti and street art, the Sunday outdoor markets on Avenida Paulista for their colourful crafts, and the 138-metre-high Octávio Frias de Oliveira Bridge (known as Ponte Estaiada) for its Pinheiros River views. Another snap-and-post icon is the 38-story Edifício Copan (Copan Building) - Oscar Niemeyer’s colossal curving structure that has a famous sinuous facade and its very own postcode. Hashtag hotspots: Saunter down to the Museum of Art São Paulo. Even if you don’t make it inside to marvel at masterpieces by Picasso, Van Gogh and Cézanne, the exterior of the Lina Bo Bardi-designed building is worth the tag. To step up your Insta game further, visit Livraria da Vila - the beloved bookstore applauded for its revolving doors made from glass bookshelves. If you’re going all out for Instagram likes, the cosmopolitan city of Toronto has enough brilliant backdrops to impress your followers. And given that you’ll be waiting until 2022 for the ambitious 85-story tower known as The One to make its debut (at 306.3-metres-high it will be the tallest in Canada), the CN Tower will demand your attention; not least for its LookOut and SkyPod viewing platforms that offer panoramic shots of Lake Ontario. If you prefer to keep things on ground level, the restored Distillery Historic District is one of the coolest places to connect millennials to the city’s booze-filled past. Head here to take selfies on cobblestone lanes lined with the nation’s best-preserved collection of Victorian-era buildings - and make the most of the area’s converted warehouses, high-ceiling lofts, boho boutiques, art galleries, restaurants, and farm-to-table cafés. And then, of course, there’s Toronto’s “Manhattanized” skyline, which is eye-poppingly stunning no matter how many times it appears on an Instagram feed. Some of the best places to photograph the epic steel-and-glass towers are Trillium Park on the grounds of Ontario Place, Chester Hill Lookout off Broadway, and the peninsula known as Leslie Street Spit. 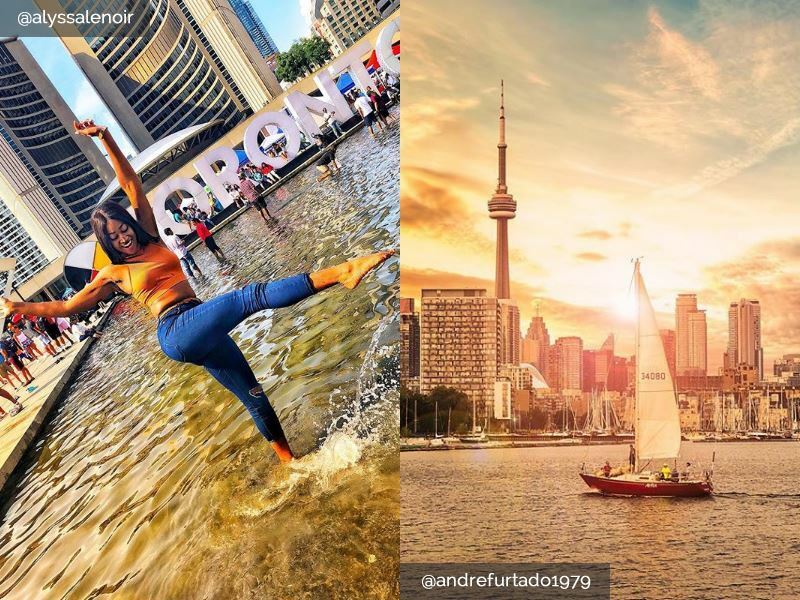 Hashtag hotspots: The ferry ride to Lake Ontario’s Toronto Islands thrills with eye-catching images of the downtown core. You’ll also get excellent photos all year round in Nathan Phillips Square - the vibrant space in the heart of the city that offers old and new architecture, an illuminated Toronto sign, and a magical ice skating rink that opens during the winter months. You can’t fail to stay smartphone-happy in Las Vegas, Nevada’s glitzy and glamorous desert metropolis celebrated for its no-expense-spared casinos, star-chef restaurants, exclusive nightclubs, drive-through weddings, Elvis impersonators, and seriously huge shopping malls. And then, of course, there’s the high-rise themed hotels - many of which are ridiculously over-the-top (they require a sense of humour), resolutely luxurious, and surprisingly affordable. 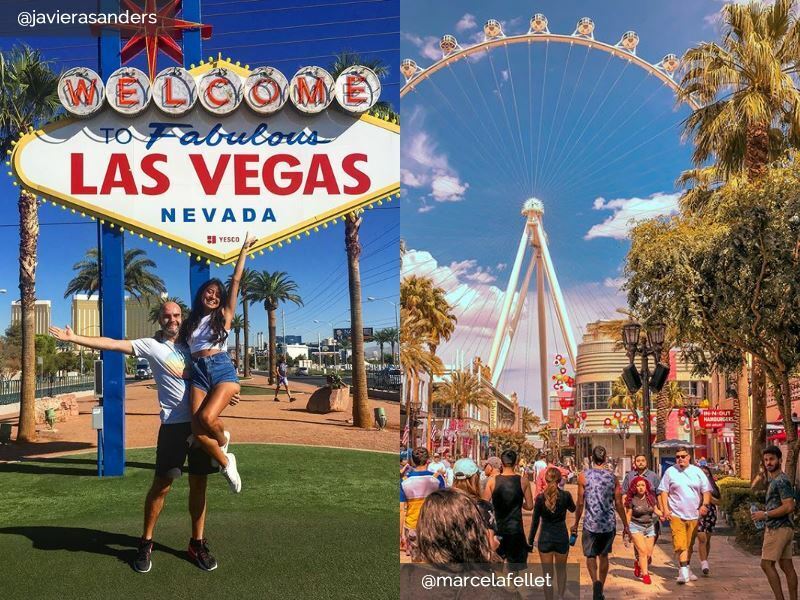 Some of the best spots for selfie-backdrops include The Venetian for its replica canal and authentic(ish) singing gondoliers, Caesar’s Palace for its Roman Empire décor and Forum-style shops, Paris Las Vegas Hotel & Casino for its scaled-down Eiffel Tower replica, and New York-New York for its skyscrapers and rollercoaster. Also visit the Bellagio for its 1,000-plus dancing fountains and The Cosmopolitan for its three-level bar inside a giant pink-purple chandelier. Elsewhere, made a beeline for the 25-foot-tall Welcome to Fabulous Las Vegas sign which has been attracting visitors since 1959 (the queues are worth the payoff) and factor in a visit to the Fremont Street Experience for its fabulous (and free) sound and light show that kicks off every night at 7pm. Hashtag hotspots: The High Roller at The LINQ Promenade is a must for panoramic city views (it’s the world’s tallest observation wheel). You’ll also get some on-point Insta shots at the Seven Magic Mountains - a man-made collection of brightly-coloured stone sculptures located along the I15 highway (roughly a 30-minute drive from The Strip; go in the morning to avoid the heat). Indoor and outdoor eye-candy shots come fast and furious in Tokyo, Japan’s head-spinning capital where just walking in the streets feels like you’re in a video game. And nowhere is more exciting for Instagrammers than the frantic people-bumping and side-swerving at Shibuya Crossing - the intersection located outside Shibuya Station (aim to photograph it at dusk for the most flattering light). You’re also spoilt for choice when it comes to shrines; most famously Meiji Shrine for its forested 200-acre park made of ancient cypress trees, Sensoji Temple for its crimson gate, imposing temple buildings, and five-story pagoda, Tennoji Temple for its centuries-old bronzed Buddha, and Nezu Shrine for its dazzling azalea garden that bursts into bloom during springtime. Must-dos include following the smartphone-clutching masses to the beautiful Shinjuku Gyoen National Garden, the glittering Nakameguro River, and the Tsukiji Fish Market (the 5am tuna auctions are worth dragging yourself out of bed for). 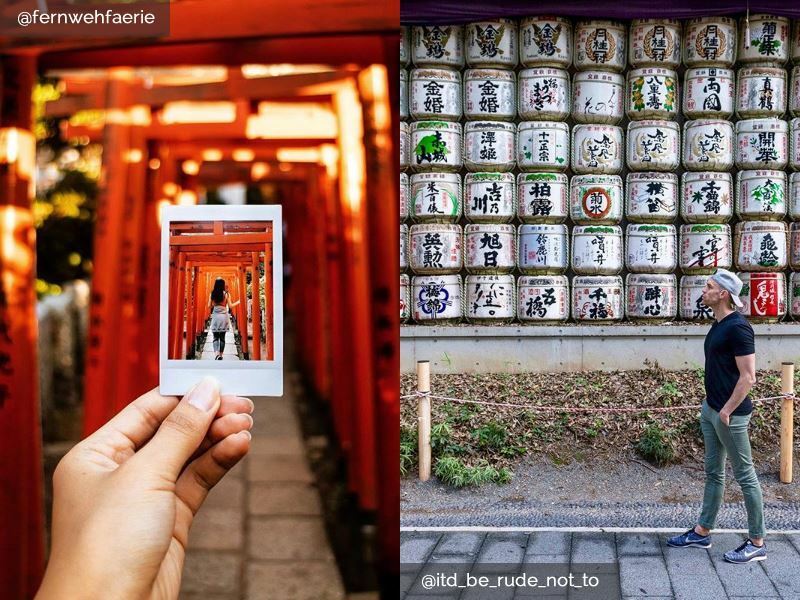 Also head to the selfie paradise of Takeshita Street, the so-called “cutest street in Tokyo” that wows with pink crêperies, offbeat kawaii fashion boutiques, pop-art dining experiences, and candyfloss vendors. Hashtag hotspots: There’s no better way to see Tokyo’s iconic sights than from the Roppongi Hills, a city-within-a-city complex with restaurants, shops, apartments, an art museum, and (most crucially) an observation deck. Also head to the Tokyo Tower’s 250-metre-high Top Deck for a perfect bird's-eye view of the entire city (on a clear day you’ll be able to see Mount Fuji). 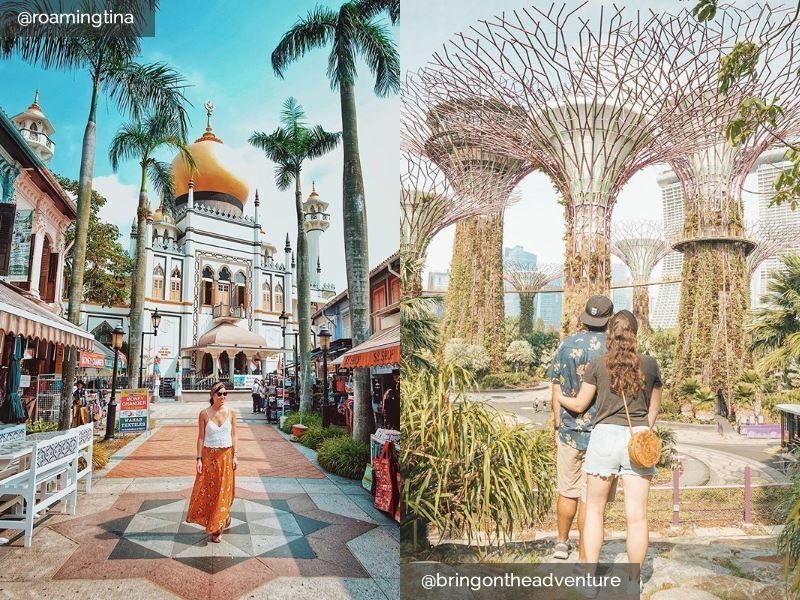 If you relish filling your Instagram feed with awe-inspiring travel pictures from the Little Red Dot (the nickname bestowed on the city-state of Singapore for its depiction on world maps), Gardens by the Bay is an all-out winner. Located just minutes from Marina Bay Sands, this colourful horticultural wonderland spanning 250 acres is mostly free-of-charge for those wanting to get up-close with nature. Big-name attractions include Supertree Grove for giant Avatar-like tree sculptures that come to life at night with a light and music show, the OCBC Skyway for panoramic vistas of the Marina Bay skyline from 22-metres above ground level, and the Cloud Forest for a huge greenhouse-like glass dome housing the world’s tallest indoor waterfall. Equally visit-worthy is Koon Seng Road for its photogenic houses in glorious pastel shades of pink, yellow and aquamarine, Merlion Park for its iconic 28-foot statue (a half-lion, half-fish stone carving that shoots water into the bay), and Esplanade - Theatres on the Bay for its architecturally-stunning performance spaces. Another unrivalled spot is the ArtScience Museum, home to Future World - a permanent exhibition featuring dazzling digital art installations. Hashtag hotspots: If you’re looking for vibrant street art and eye-catching murals to pose in front of, the tiny Haji Lane in Kampong Glam is Singapore’s original indie neighbourhood. For more unusual images, head to the whitewashed Marina Square Maze located on the rooftops of Marina Square (don’t go alone as you’ll need someone to take shots of you from above). 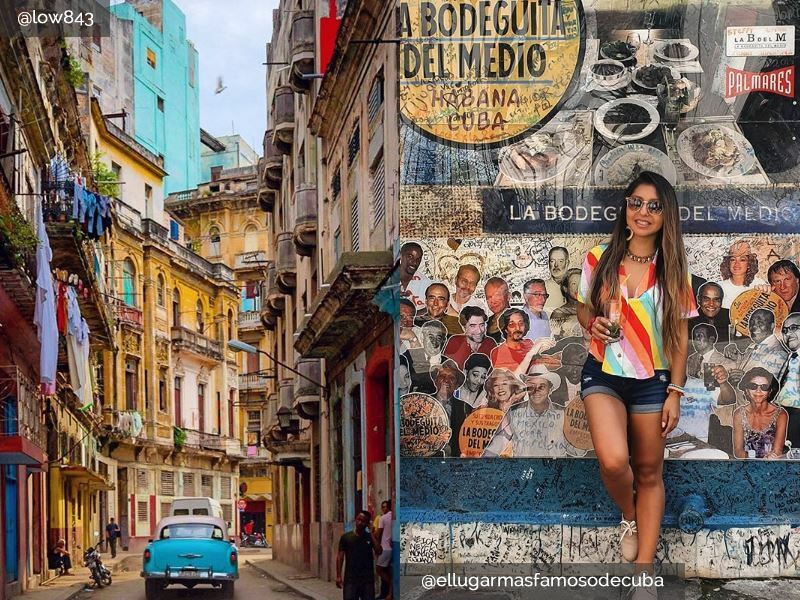 Cuba’s fascinating capital of Havana is Insta heaven; you won’t find a more hypnotic mix of vintage American cars, decaying Art Deco colonial buildings, atmospheric squares, avant-garde street art, and an insatiable salsa energy like this anywhere else on the planet. And while there have been plenty of changes in tourism of late (a swathe of new big-name and boutique hotels are reshaping the landscape), it’s the old staples that will generate hundreds of likes; think El Capitolio, the Malecón, Plaza del La Revolución, Parque Central, Plaza de la Catedral, and Havana Harbour. To add interest to your feed, browse the book market at Plaza de Armas, watch a ballet at the Gran Teatro de La Habana, ride around the city in a yellow rickshaw-type cocotaxi, and end the day at El Floridita (Ernest Hemingway believed the frozen run daiquiris served here to be the best in the world). Further stellar attractions include the swanky suburb of Miramar for sweeping avenues lined with Miami-style mansions and the mostly residential neighbourhood of Vedado for era-defining buildings and landmark hotels (most famous is Hotel Nacional de Cuba which opened in 1930 as a rum-soaked playground for the famous and infamous). Hashtag hotspots: Head to the sky-scraping La Torre bar on the FOCSA Building’s 34th-floor for epic shots of the Malecón and beyond. Another amazing spot for cityscapes is Fortaleza de San Carlos de la Cabaña, the historic 18th-century hillside fort from which actors dressed in military gear fire canons in a special ceremony that takes place nightly at 9pm. There’s no shortage of places to point your smartphone at in Los Angeles, the no-filter-needed West Coast playground complete with a 72-mile shoreline, red carpet-worthy attractions galore, and heaps of different suburbs (there’s no real “centre” so precision planning is required). 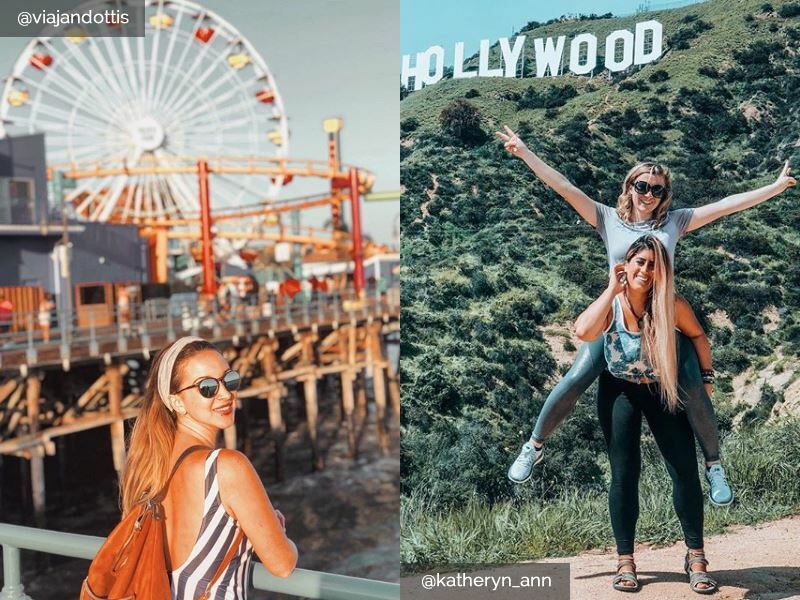 Must-dos include hiking the trails behind the Hollywood sign, walking the Hollywood Walk of Fame, stopping at the TCL Chinese Theatre to see the cemented handprints and footprints of illustrious superstars, grabbing selfies with bodybuilders at Venice Beach Boardwalk, and fuelling your hunger at the Original LA Farmers Market and the adjacent Grove. You can also shop in style on Rodeo Drive, museum hop along Miracle Mile, catch a gig at the Hollywood Bowl, pay your respects to studio moguls, screenwriters, actors and directors at the Hollywood Forever Cemetery, and ride the world’s only solar-powered Ferris wheel at the Pacific-facing Santa Monica Pier. Once you’ve cruised along Sunset Boulevard and reached the fabled beach town of Malibu, be sure to stake out celebrity-owned oceanfront homes, wave-watch at Surfrider Beach, and admire the Getty Villa - the original home of the Getty Museum, which opened in 1974. Hashtag hotspots: Nothing beats the Griffith Observatory for unobstructed views of the Los Angeles skyline, the Pacific Ocean, and the Hollywood sign. For fabulous selfie ops, the 100-block Fashion District features over 2,000 stores and warehouses (it’s also home to Santee Alley, the open-air shopping path with a festival-like vibe and amazing bargains). 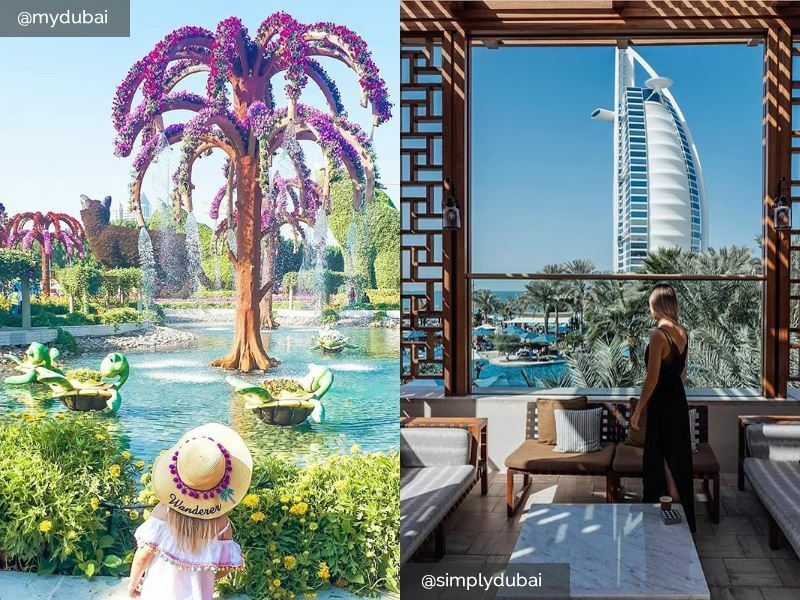 Instagrammable images are limitless in Dubai, the once humble fishing village turned dazzling desert metropolis where absolutely nothing is understated. For wide-eyed beach fans, Jumeirah Public Beach is a great starting point; not least because you’re guaranteed shots of the sail-like Burj Al Arab - one of the world’s first hotels to be awarded seven stars (the chauffer-driven fleet of bespoke Rolls-Royce Phantoms outside is a giveaway). Equally enthralling for selfie-seekers is the 828-metre-high Burj Khalifa (shoot from ground level or head to the 555-metre-high observation deck for panoramic views), the glamorous Dubai Marina, and the intoxicating Souk Madinat Jumeirah - a recreation of an ancient Middle Eastern marketplace. To spice up your feed further, ride an abra across Dubai Creek, join a volleyball game on Kite Beach, take photos outside Jumeirah Mosque, stroll around the quaint Al Fahidi Historical Neighbourhood, and paddle around the Palm - the giant man-made archipelago that juts out into the Arabian Gulf. Also factor in a trip to the magnificent red-sand desert for sensational sunsets, interesting Bedouin village tours, bumpy camel rides, and a spot of dune bashing in a 4WD. Hashtag hotspots: The Dubai Miracle Gardens provides the perfect Insta backdrop with more than 60 million blooms, nine custom-built domes housing over 35,000 species of butterflies, and a life-size Airbus A380 made entirely from flowers. Also head to the avant-garde Dubai Design District for a great selection of modern sculptures and art installations to pose next to. Thailand’s colourful capital is an Insta paradise that mixes the old (Buddhist monks clad in saffron-coloured robes, sacred religious sites, floating markets) with the new (towering skyscrapers, high-end futuristic clubs, luxury hotels with fancy spas). It’s also where you’ll be awed by a huge amount of striking-looking shrines, the most unique of which is Wat Pariwat (bizarrely nicknamed the David Beckham Temple after a Manchester United-supporting monk replaced a winged Garuda with an image of the footballer on the base of the main Buddha shrine). For more visual treats, explore Rattanakosin’s Phraeng Bhuthorn Road for its iconic street food institutions, Lumphini Park for its lake filled with monitor lizards and paddleboats that resemble swans, and Airplane Graveyard for a morbid but marvellous wasteland filled with decaying jets and bits of old aircraft. Other memorable experiences include taking a boat trip along the Chao Phraya River, shopping at Siam Paragon, admiring ancient Thai art at the Bangkok National Museum, and spending time in Soi NaNa China Town - one of the coolest streets in the city for its eclectic mix of art galleries, breweries, restaurants, funky bars, and clubs. Hashtag hotspots: The city’s hotel rooftop bars are perfect for post-sightseeing drinks and cocktails. 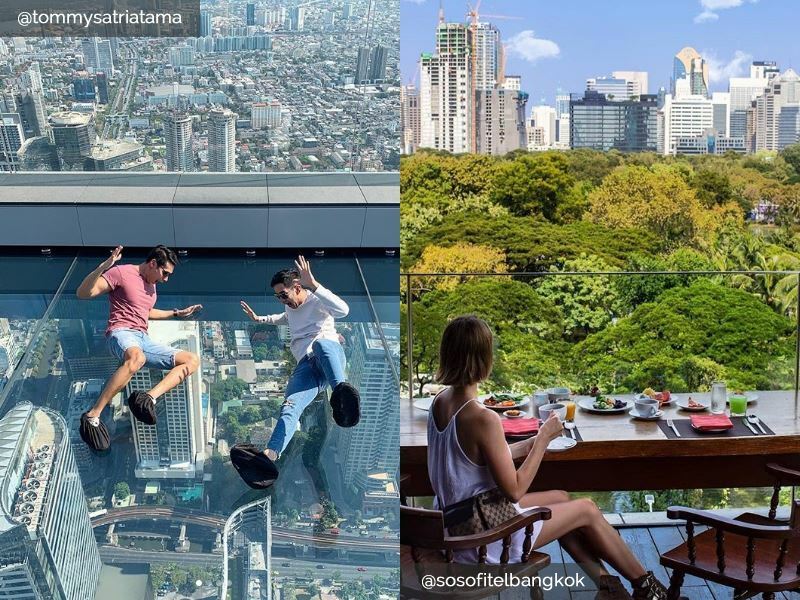 Some of the best include Sky Bar At Sirocco (Lebua Hotel), Blue Sky (Sofitel Centara Grand), The Long Table (Column), Three Sixty (Millennium Hotel), Vertigo (Banyan Tree Bangkok), Penthouse Rooftop (Park Hyatt Bangkok), and Brewski (Radisson Blu). 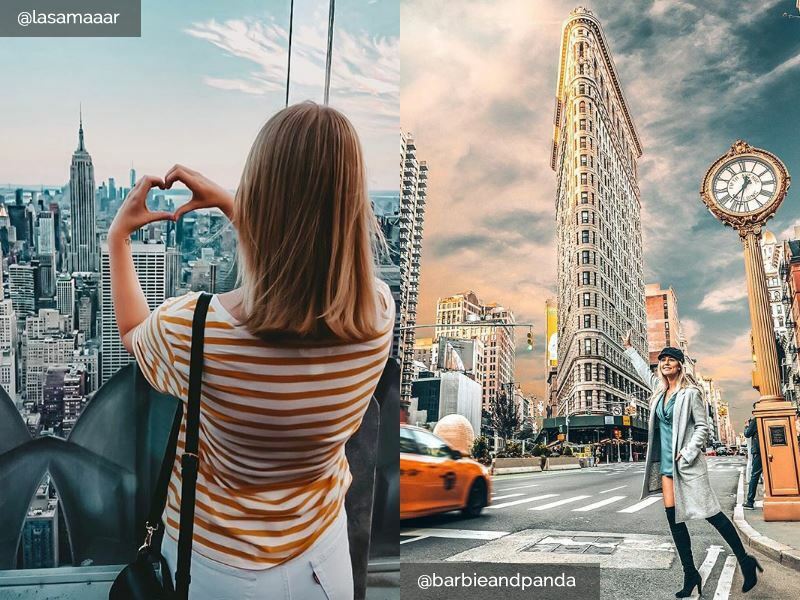 As the most photographed metropolis in the world, Big Apple Instagrammers have a lot to look forward to. If you really want to wow your followers, visit the cylindrical Guggenheim Museum, walk the span of the Brooklyn Bridge, bag a spot on the red TKTS stairs below 47th Street to capture the neon lights of Times Square, and shoot the Angel of the Waters statue atop the Bethesda Fountain in Central Park from multiple angles. Also stop for selfies on the main concourse of Grand Central Station, admire the iconic Imagine mosaic in the centre of Strawberry Fields, and take a New York Harbour cruise at sunset for the best shots of the Statue of Liberty in all her glory. If it’s skyscrapers you’re after, the observation decks of the Empire State Building and the Rockefeller Center are both well worth the long queue time - but the One World Observatory allows superior 360-degree views and has the most impressive high-tech features. For more YOLO (you only live once) posts, walk along The High Line, grab last-minute tickets to a baseball game at Yankee Stadium, pose with a Rockette at Radio City Music Hall, eat breakfast at Chelsea Market, and shop your heart out on Madison Avenue. Hashtag hotspots: Brilliant shots of the 22-story steel-framed Flatiron Building are assured on 23rd Street - or from Madison Square Park. For more off-the-beaten track photoshoot locations, head to Socrates Sculpture Park in Queens, Brooklyn Botanic Garden in Prospect Park, Greene Street in Soho, and The Morgan Library & Museum in Manhattan’s Murray Hill neighbourhood.